Polycarbonate is a transparent, strong, and stiff thermoplastic material with outstanding impact resistance. Toughness and optical clarity make polycarbonate ideal for a wide variety of applications including machine guards, indoor and outdoor signs, architectural glazing, face shields, skylights, and point-of-purchase displays. Polycarbonate rod and plate are easy to machine and have excellent dimensional stability. Custom polycarbonate parts are used for numerous applications including electrical components, manifolds, sight glasses, and semiconductor machinery parts. Belonging to a particular group of thermoplastic polymers, polycarbonates can go by several names. 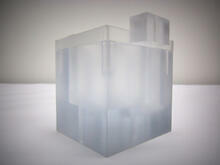 Most commonly, they are referred to as Lexan, Makrolon, or Makroclear. All of which are trademarked names by various manufacturers. 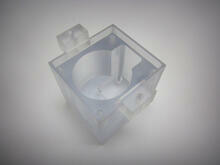 Vanderveer Industrial Plastics stocks and fabricates custom polycarbonate parts. Vanderveer's CNC machining equipment produce parts to extremely close tolerances. Vanderveer Industrial Plastics has been a reliable supplier of polycarbonate sheet, rod and tube for more than 60 years! For more technical details on the difference between polycarbonate and 20% glass-filled polycarbonate, please refer to the .pdf below. For additional information on Polycarbonate plastic materials, contact your local Vanderveer Industrial Plastics representative or call Vanderveer Industrial Plastics at 714.579.7700.